Google Certified Developer Agency for the second time in a row! 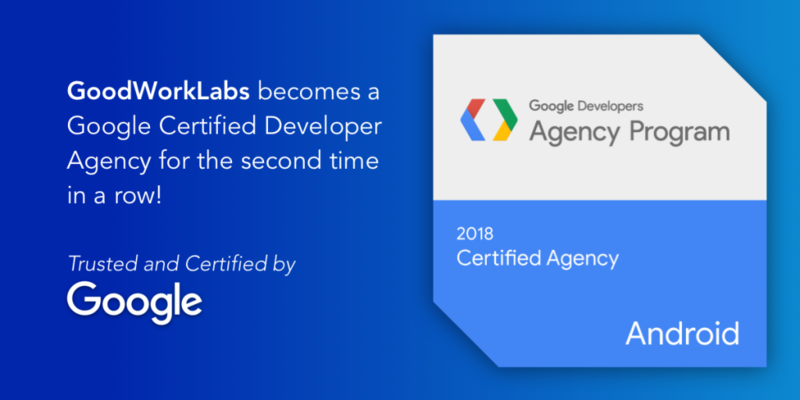 GoodWorkLabs is super happy and proud to announce that we have bagged the coveted title of Google Certified Developer Agency once again and this is the second time we have been honored with this prestigious title. In 2017, GoodWorkLabs was one of the six developer agencies from India to get selected for this coveted program and this year too, we continue to remain on the top position by showcasing our expertise in building powerful and fault-tolerant Android applications. With over 60+ mobile apps listed in the Play Store and consumer applications that have generated millions of downloads, GoodWorkLabs has always been the top choice for both Startups and MNCs. By bagging the Google Certification, we have gained the credibility and validation that we understand Android technologies better than anyone else! Every year, Google conducts a very stringent evaluation process for agencies to qualify for this coveted certification. Only a hand-full of agencies who have undergone the required training and have demonstrated expertise in building exceptional Android applications manage to get recognized by Google. This year, GoodWorkLabs was one among the chosen few for the prestigious title of Google Certified Agency. This only goes on to speak volumes about the continuous dedication and innovation that our team puts into designing and developing powerful scalable Android technology and mobile apps. The leadership team at GoodWorkLabs is super thrilled and had some great thoughts to share on this incredible achievement by the GoodWorkLabs team. We at GoodWorkLabs are constantly innovating and building powerful technologies to help businesses excel. Partner with us and we can help you build a platform that will scale up your business model.